it offers unprecedented opportunities and ease of market entry especially through Internet. As rapid change and discontinuities of the new economy offer unlimited opportunities, growing requires entrepreneurial creativity, curiosity, imagination, and emotional energy – qualities that exist, and even abound, among the people in your company. Change brings opportunity to those who can grasp it. In today's world characterized by rapid unpredictable change and volatility, the sustainable ability to change is much more important than the ability to create change in the first place. The ability to change can be achieved by building an adaptive organization and synergizing systemically such corporate capabilities as strategy innovation, value innovation, extreme leadership, and enterprise-wide business process management. People as your most important asset. Your technologies, products and structures can be copied by competitors. No one, however, can match your highly charged, motivated people who care. People are your firm's repository of knowledge and they are central to your company's competitive advantage. Well educated, coached, and highly motivated people are critical to the development and execution of strategies, especially in today's faster-paced, more perplexing world, where top management alone can no longer assure your firm's competitiveness. At the heart of the inclusive approach is the belief that understanding stakeholder needs – the needs of customers, employees, suppliers, shareholders, society, and the environment – and incorporating them into enterprise strategy are central to the achievement of sustainable growth and competitiveness. 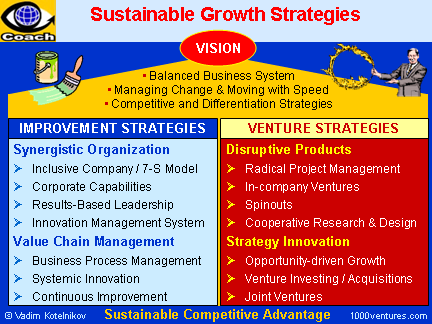 Various business performance improvement approaches focus on alternative ways to build and run a company. The concept of “virtuous circles” is one of them. It has all those contributing to value creation for the customer pulling forcibly in the same direction. In practice, this also means identifying and balancing short- and long-term goal structures for all stakeholders and changing management incentive schemes to promote long-term sustainable performance.